As the menacing souls continue to loom over Richard, Robo's metallic voice calmly advises the Chosen One not to touch the souls because they are made of anti-matter. The souls meanwhile form an enormous serpent, its head grinning evilly at Richard. Suddenly wondering aloud what would happen if matter meets anti-matter, Richard reaches behind him and picks up a shard from one of the broken glass spheres and hurls it at the snake's body. Upon touching the snake's head, a series of explosions immediately rock the Library as the head implodes with a firework-like spark, followed by the rest of its body. One clump of souls explodes in such a way that it blasts a hole in one of the Library walls, releasing sunlight into the room. Richard and Robo quickly escape toward the hole as the rest of the snake's body destroys itself. Upon hurling himself outside, Richard sees a welcome sight waiting for him: the cybercruiser patiently hovering just oustside the Library wall. The Chosen One and Robo quickly climb on and soar into the air as the entire Library is engulfed in flames and disintegrates in the flames. The pair fly away from the scene in silence until Richard notices a change in scenery. 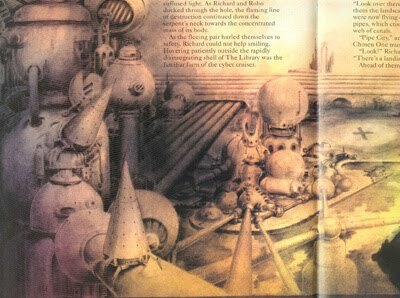 He points out to his companion that the landscape had morphed into a sprawlin network of pipes and canals, which Robo identifies as Pipe City, the place where Richard must seek out the Omni Piece. Amidst the pipes, Richard spies a landing pad and sends the cruiser down upon it for a landing. There, the two inspect the various pipes, which Robo says contain either toxic waste or highly pressurized air. Just then, a sound alerts Richard, and he turns to see a group of cone-shaped creatures approaching him. Robo identifies them as Spikers, robots attracted to movement and armed with deadly plasma spears. One Spiker emphasizes Robo's last point by firing a spear at Richard, barely missing him. Richard and Robo immediately turn and flee through the maze of pipes and canals to lose the Spikers, and soon they are hopelessly lost. They eventually emerge in a large open space, where Robo says that they have lost the Spikers, but a loud humming sound indicates a new presence is approaching. Moments later, Richard see this new life form: a giant glowing, pulsing, floating crystal with human-like features in its surface. The giant crystal approaches the pair and identifies itself as Terraforma, environmorph, and guaranteed a fun time. Richard almost relaxes at the being's words, but then recalls the seemingly angelic Peter back in the Library. 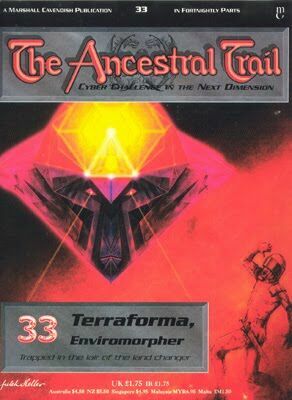 Suspicious, Richard asks Terraforma what an environmorph is, which caused the crystal to alter its pulses. A beeping sound alerts Richard to a new message on Robo's panel, and he quickly tries to decode it, but Terraforma's hypnotic gaze draws his attention away from the panel. Terraforma answers the Chosen One's question by stating he can change the environment, and he orders Richard to approach him. 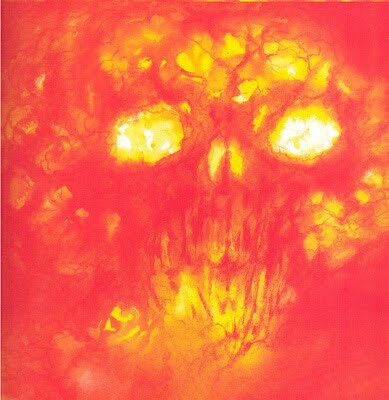 Richard does so, and as he gazes into a red beam pulsing from the gem's forehead, the world around Richard bursts into flame, both the ground and the very air set alight. Terraforma mocks Richard as he attempts to get his sword, and the environment again changes, this time into a icy wasteland that freezes Richard where he stands. Knowing he can't take another extreme weather change, Richard tries turning to Robo, who is still encased in flame. By chance, Richard sees the binary panel and uses his fear to translate the message at a frantic pace. He instantly understands the message and asks Robo if any Spikers are in the vicinity. When Robo confirms this is so, Richard asks Robo to draw them in. Robo does so by flailing about and moving around frantically. The Spikers, drawn by the movement, appear almost immediately. Robo shoots himself into the air and the Spikers hesitate for a moment before bypassing the immobile Richard and targeting Terraforma, who is spinning wildly. The Spikers surround the environmorph and fire a storm of plasma spears at it. The giant crystal tries to escape, but one plasma spear lands directly in the crystal's giant heart. Terramorpha shatters into a thousand shards, and immediately the environment reverts back to normal. Richard thaws out and quickly rushes to his companion, who had been struck by a ricocheted Spiker spear. The robot assures Richard that his circuits are still fine and says that the Chosen One needs to retrieve the Omni Piece, which is held inside a large citadel shaped like a crouching spider. The Spikers are still nearby, however, and approaching the pair. Richard spies an open pipe and leads his friend to it. The two of them jump inside and are quickly carried away by a powerful current of air. Richard and Robo are forced to let the current take them wherever it goes, unable to even slow themselves down or stop themselves from spinning like fired bullets. 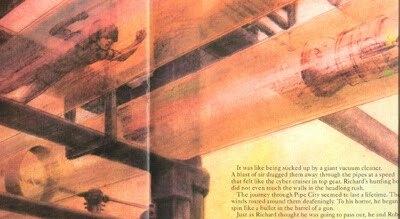 After a seemingly endless journey, the pipe abruptly spits Richard and Robo out, sending them into a fall toward a waterway filled with toxic waste. Richard by chance lands on a platform at the pipe's mouth, but is moving so quickly he falls over the edge. Before he can fall into the sludge, Robo fires a series of flexible cables tipped with suction cups, which grab Richard and prevents him from falling down. The robot pulls the Chosen One to safety, and the two of them find themselves outside of the Citadel. The pair climb a nearby set of stairs to a large pair of double doors, which Richard opens. 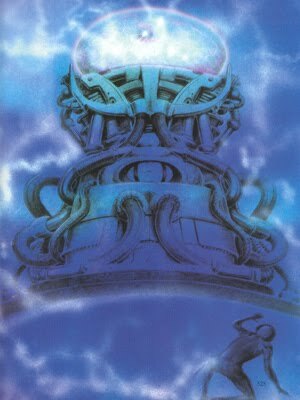 Inside, he finds a massive glass dome on a circular plinth, with large waves of energy spinning inside the spherical glass. Richard asks what it is, but Robo's sensors are for some reason being repelled. Curious, Richard climbs the plinth and taps the glass. Suddenly, a pure energy bolt is fired from within the glass and knocks Richard back to the ground. Robo rushes to help, but another bolt strikes him and sending him flying back. Behind them, the door suddenly close. The glass dome begins to rise and the plinth extend, and from inside the globe something resembling a giant eye can be seen. A booming voice is heard, declaring that the sanctity of the Citadel has been broken, and that the defier must answer the Keepr's challenge, for it is the Law. Robo tries to say something, but the Keeper fires another bolt at him and renders the robot silent. Richard is horrified, but the Keerp declares that robots must be deactivated inside the Citadel, for it is the Law. The Keeper again declares Richard must answer its challenge, but Richard insists Robo is reactivated, at least outside. Finding no conflict, the Keeper opens the doors and uses another energy bolt to send Robo outside. The Keeper then demands that Richard must answer three question within an allotted time without lying. However, even if Richard wins, he will still be destroyed for defiling the Citadel. This is the Law. As Richard ponders how to exploit the Keeper's reliance on his rules, the Keerp begins its questioning. The Keeper first asks for Richard's name. It then asks Richard if he is the Chosen One. The third question is, perplexingly, "What is inside of you?" Richard is unable to come up with an answer within five time units. The Keeper looks ready to destroy Richard when the Chosen One pleads to ask one question himself. The Law permits one question, so the Keeper allows it. Richard asks the Keeper, "I always lie - and that's the truth. Do I now speak the truth?" The Keeper screams that it has been tricked, but Richard reminds it that it must answer, because it is the Law. 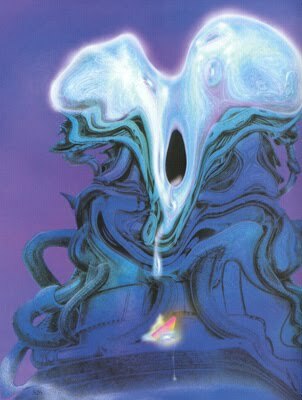 The Keeper struggles to find an answer to the paradox and sends energy through its channels that were never intended to take such a load. All of this diverted heat causes the Keeper to burst into a heatwave as the glass dome suddenly starts to melt. The voice of the Keeper muttering possible answers continues to be heard until the glass dome impodes in a shower of sparks. Robo, reactivated, re-enters the chamber and declares simply that Richard is indeed the Chosen One. Lying in the wreckage of the Keeper is a small glittering triangle, which Robo states is the Omni Piece. Triumphant, Richard reaches down and picks up the piece. As soon as he does, he feels faint and senses his strength being drained from his body. He almost immediately collapses to the floor and blacks out. 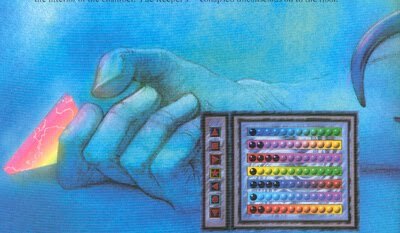 For the thirty-third issue of The Ancestral Trail, we finally get to see the MacGuffin of the Cyber World, the Omni Pieces. 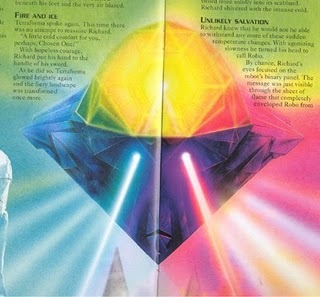 Introduced way back in issue twenty-nine, the Omni Pieces are the Life Force Pods of this world and will drive Richard around the Cyber Dimension. Of course, the reader will care more about Richard's journey than the actual pieces themselves, similar to how the reader cared more about the Ancestral World than the Pods. This is a common plot device in fantasy fiction, after all. One interesting twist about the Omni Pieces, though, is their apparent deadliness: as soon as he touched the Omni Piece, Richard fell unconscious. So unlike the Pods, which bestowed knowledge and courage, etc., to the Chosen One, it seems these items can kill him. One thing you may be wondering about is what that strange "panel" is in the last picture above. Is it meant to be there, blocking the artwork like that? Is it some kind of visual game in the Ancestral Trail series, similar to finding Shoomi and Shoobi? In actuality, these panels do play an important part in the Cyber Dimension, but to mention their purpose now would be to spoil things heavily. Their purpose will be revealed eventually, I promise. Finally, there is one small yet noticeable plot hole that I can't help but wonder about. 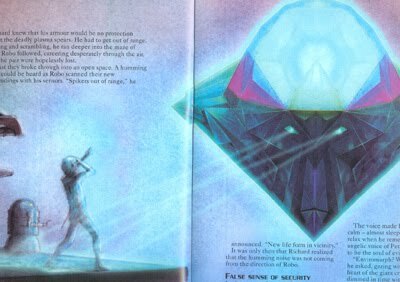 In the Holotron issue, Richard and Robo entered the citadel inside the giant mountain because it was the only way to get through, and also because inside was the Omni Piece. In doing so, they had to abandon the Cyber Cruiser. However, after destroying the Atomizers (the evil souls) and escaping the Library, Richard and Robo find the Cyber Cruiser waiting for them on the other side. 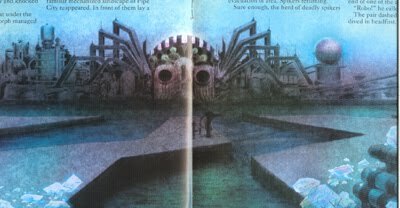 Also, the Omni Piece turns out to be located in Pipe City, far away from the underground fortress.